Belgharia is a city and suburb that is located to the north of the capital city of West Bengal, Kolkata. This is a well-known business hub located close to B.T Road, and it falls under the Kamarhati Municipality. The place is well connected to other parts of Kolkata through buses, trains and other transportation modes. The area has many schools such as Trivasa Academy High School, Belgharia Ramakrishna Mission (Polytechnic Institution), Belgharia Mahakali Girls High School and Udaypur Haradayal Nag Adarsha Vidyalaya; health centers and hospitals like Ariadah Matri Sadan, Diagaid Clinic & Diagnostic Centre and Sagar Dutta State General Hospital & Medical College; banks and ATMs of SBI, Bank of Baroda, IDBI etc. and markets such as Dr. P.N.Dey market, Belgharia Municipal Market and Belgharia Rail Bazar. The place comes with the charm of old Kolkata along with all the new amenities and accommodations that can be expected by a modern city dweller. You will love to live here and enjoy all that the place has to offer. StarOm Millenia – Buy your dream home now! 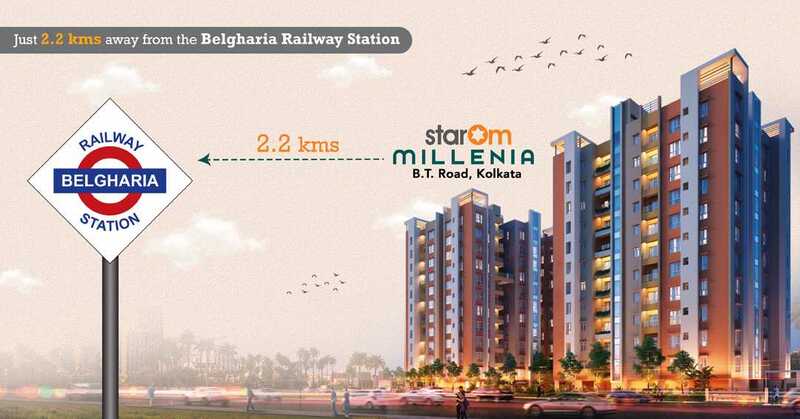 StarOm Millenia is a residential project from the prestigious StarOm Realty Group, situated at B.T. Road Kolkata. 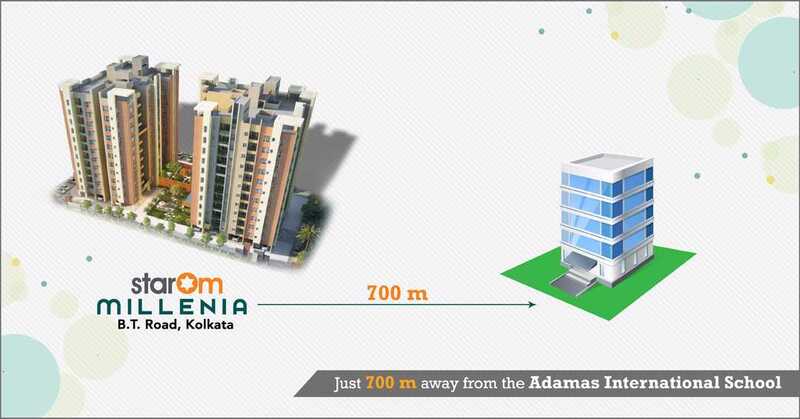 It is located only 2.2 km away from the Belgharia Railway Station and only a ten minute drive from the local airport – Netaji Subhas Chandra Bose International Airport – which connects the city to other cities of India as well as other countries such as Bangladesh, Nepal, China and Bhutan. People who need to travel frequently due to vacation or business purposes can benefit from living here. The proximity of the project to banks, hospitals, markets, schools, colleges, medicine shops, ATMs and other facilities makes it a very convenient buy. Book your flat now at StarOm Millenia, and get the chance to live a 21st century lifestyle as well as savour an old world charm.